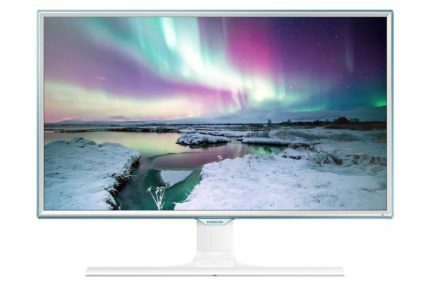 Once we embark on a hunt for a new monitor, some of us will require from it to offer us a specific feature and specifications, whether that is a high refresh rate, specific panel type, or a certain resolution. Some of us, on the other hand, will first determine the ideal screen size and then look into the specifications due to either limited budget or simply thinking that anything over a 24-inch screen is excessive. Well, here we will put together a list of all the best 24-inch monitors from a variety of different categories which will help both those seeking an amazing budget monitor of a decent size and those who are looking for a monitor with specifications only achievable by 24-inch monitors. Whether you’re looking for a monitor for everyday use, casual or competitive gaming, or photo editing, we have you covered. 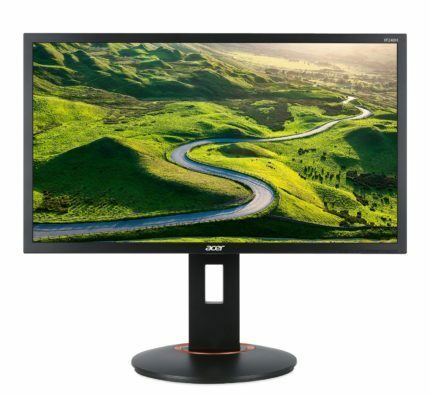 The 24-inch Full HD, 1920×1080, resolution monitors are a common standard nowadays, so if you’re looking for a great yet affordable monitor to finally update your old one, we’ll make sure that you pay the least amount for the best performance and image quality possible at a reasonable price range. In addition, professional gamers can pick their monitors according to the refresh rate and the adaptive sync technology while the professional designers can rely on our choice for the most accurate monitors for the color-critical work. As you can see in the list above, most of the gaming monitors feature a TN panel while photo editing monitors and regular consumer monitors have IPS panels. The reason behind this is that TN panels allow for a quick 1ms response time which entirely eliminates ghosting of the fast moving objects in the fast-paced, competitive FPS games. However, they also produce less accurate colors as well as less wide viewing angles which result in colors contrasting when viewed from different angles. Besides offering precise and consistent colors, the IPS panel monitors also deliver the impeccable viewing angles of 178 degrees and solid 4ms response time that although may not be quick enough for professional players, it is sufficient for the average gamer. You can read more about whether to pick a TN or an IPS panel here. Up next, you should take the adaptive sync technology into the account. These technologies allow for a dynamic refresh rate, meaning that your GPU will synchronize its frame rate with the monitor’s refresh rate. This results in a more steady FPS (Frames Per Second) rate, no screen tearing or stuttering, and reduced input lag within the dynamic range. The FreeSync technology can be used with compatible AMD graphics cards while G-Sync works only with Nvidia graphics cards. Keep in mind that you can use a FreeSync monitor with the Nvidia graphics card and vice versa, but you won’t be able to use the adaptive sync feature in that case. The difference between a 60Hz and a 144Hz monitor is huge, there is no doubt about it. Once you get used to a 144Hz monitor, there’s no going back. However, when it comes to 144Hz vs 240Hz, there are more things you should take into account. First of all, a 240Hz monitor is quite expensive by itself, not to mention all the computer equipment you’re going to need to power it, we’re talking two Titan X graphics cards for low settings to have a consistent 240 FPS in demanding video games. Granted that there is absolutely no screen tearing present in comparison to some minor visible tearing on 144Hz monitors, it still requires quite a demanding and expensive computer setup which makes them suited only for the high-end professional FPS gamers. Screen Resolutions: 1080p, 1440p, or 4K? Lastly, choose the right resolution for you. The 1080p resolution on a 24-inch monitor provides sufficient desktop space and crisp image quality for high-quality gaming and movie watching experience. Although a 1440p resolution is more popular among 27-inch monitors, on a 24-inch screen it will provide plenty of space and will most likely be scaled, depending on the personal preference of an individual user, which will again result in highly detailed picture quality. Nowadays, there are even 4K resolution 24-inch monitors which provide amazing image clarity and vibrancy; note the picture below. Introducing the Acer Predator XB241H and the ASUS ROG Swift PG248Q. For competitive and professional FPS players, the 24-inch monitors don’t get any better than these. They feature the G-Sync technology, a native 144Hz refresh rate that you can overclock to a whopping 180Hz, a rapid 1ms response time of the TN panel, and a crisp Full HD resolution. Moreover, they offer full ergonomic functionalities including the ability to pivot, tilt, swivel, height adjust, and VESA mount. They have one HDMI and one DisplayPort 1.2 as well as 2x2W built-in speakers. The screen of the monitor is covered with an anti-glare coating and surrounded by a reasonably thick bezel. Furthermore, the EyeProtect ensures flicker-less screen which allows you to play for hours to an end without stressing your eyes. Although the TN viewing angles amount to 170 degrees horizontally and 160 vertically, it should not affect gamers sitting in front of the monitor; as far as movie watching is concerned, you can always tilt and adjust the right angle in order to comfortably watch the screen from any angle and distance. The OSD menu also allows you to save and edit customizable gaming presets as well as to place a custom crosshair overlay in the middle of the screen for increased precision in FPS games. 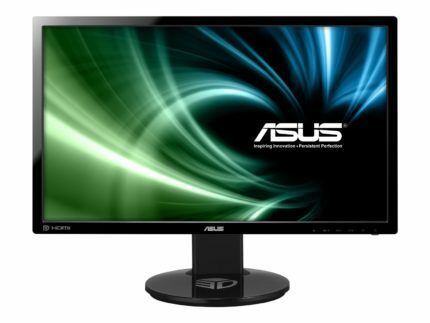 These two monitors are identical when it comes to the performance, price, and image quality, and differ only by the OSD menu (The ASUS PG248Q monitor has a more user-friendly OSD menu) and design. All in all, the Acer XB241H and the ASUS PG248Q G-Sync displays offer everything a professional or aspiring gamer might need for their heated gaming sessions. You can pick between the two according to your personal preference of the design or pick whichever is on the sale, you won’t be disappointed by either one. If you’re looking for an affordable 144Hz gaming monitor for competitive FPS gaming, the inexpensive ASUS VG248QE monitor is your best choice even though it doesn’t feature any adaptive sync technology. With 144Hz refresh rate and 1ms response time, FPS games will appear drastically more fluid and smooth which will give you the edge over your opponents with regular monitors. Moreover, the ASUS VG248QE gaming monitor features full ergonomic functionalities including pivot function and VESA mount. It offers plenty of connectivity options including a DisplayPort, an HDMI, and a Dual-Link DVI port as well as 2x2W built-in speakers. Additionally, it includes a GamePlus feature which allows you to place a fixed crosshair and a timer on your screen. Now, the bezel is somewhat thick but the overall appearance of the monitor is more elegant and modern than on pictures and for the money it costs, it’s totally reasonable. The colors are a bit weak out of the box, but once properly calibrated they can appear much more vibrant. Apart from that, the viewing angles are as expected of a TN panel monitor and amount to 170/160 degrees. Nevertheless, with a proper graphics card, say at least Nvidia GTX970, and the ASUS VG248QE, you can dominate the battlefield with ease. For those who have no intentions of going beyond 75Hz, the LG 24MP68VQ is an excellent choice for a gaming monitor at an affordable price. It features the FreeSync technology up to 75Hz, 5ms response time, and some exclusive gaming features. The AH-IPS panel provides the impeccable 178-degree viewing angles and vibrant colors that cover over 99% of the sRGB color gamut. Moreover, it’s factory calibrated, so you won’t have to tweak the settings yourself; in fact, you’ll be able to swap between several pre-calibrated picture presets via the OSD joystick that’s placed beneath the screen. 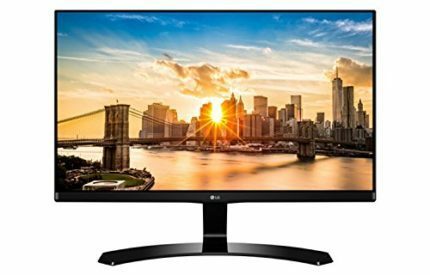 Additionally, the LG 24MP68VQ FreeSync monitor comes with a CD with software for an on-screen display which allows you to adjust OSD settings in a desktop application and the Screen Split feature for splitting the screen into fourteen different layouts. In the OSD settings, you can also enable the Black Stabilizer feature which increases the visibility in the dark scenes. There is a VGA, a DVI, and an HDMI port at the back as well as the headphones jack. The monitor is charmingly slim and has a very narrow bezel while the screen is coated with an anti-glare coating. The very affordable Acer R240HY IPS display is one of the most affordable monitors available yet it offers a gorgeous, slim, and thin-bezel design with a flawless image quality. It features an IPS panel with accurate and consistent colors as well as the impeccable viewing angles and a quick 4ms response time. The connectivity includes a VGA, a DVI, and an HDMI 1.4 port. Unlike the previously mentioned monitor, the Acer R240HY IPS display features no adaptive sync technology and it’s limited to 60Hz. It also has limited ergonomics since the only adjustable option is tilt by -5,15 degrees; furthermore, it is not VESA mount compatible. Regardless of all the minor drawbacks, this monitor delivers a surprisingly immersive and crisp image quality for its price and it looks enticing! 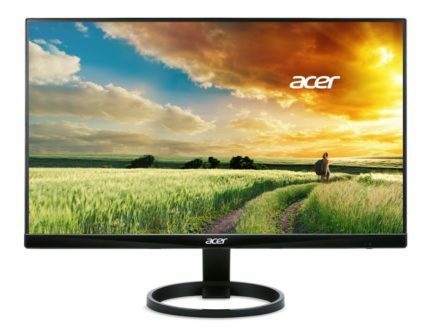 No matter your budget or intentions with a monitor, you should always have the Acer R240HY display in mind as your starting point; it’s worth more than a lot of much more expensive monitors. Since most of the 120Hz monitors are discontinued or replaced by 144Hz monitors, we’ll leave them out. 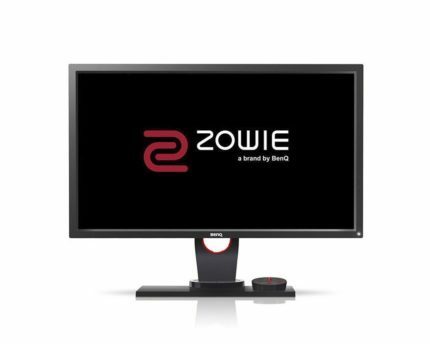 Meet the official monitors for the various PC eSports tournaments, the BenQ Zowie XL2411 and the BenQ Zowie XL2430. Whether you’re professionally playing CS: GO or Overwatch, these monitors will provide you with the smoothest FPS experience thanks to their numerous features and fluid performance. Both of these monitors feature the same TN panel with the rapid 1ms response time, flicker-free screen, 144Hz refresh rate, and a low blue light filter which allows for hours of playing without straining your eyes. More importantly, both monitors offer the Black eQualizer feature which increases the visibility in the dark scenes of video games as well as a well-known feature of the BenQ monitors, the Blur Reduction. The main difference between the two lies in the connectivity. The BenQ XL2411 TN monitor features a VGA, a Dual-Link DVI, and an HDMI port while the BenQ XL2430 has two HDMI ports, a VGA, a DVI-DL, and a DisplayPort 1.2. Both monitors also have the headphones and microphone jacks as well as an anti-glare screen coating and versatile ergonomics including height adjustment, tilt, and VESA mount compatibility. The main difference is that the BenQ XL2430 PC monitor comes with an extra device called S.Switch which allows you to quickly navigate through the OSD menu, change settings, picture presets, input sources, etc. Additionally, it offers the Color Vibrance feature which provides you with 20 adjustable levels for better color representation. Obviously, it’s a bit more expensive than the BenQ XL2411 display because of these extra features, so if you don’t care for them and would rather save some money, opt for the BenQ XL2411 gaming monitor. The AOC G2460PF monitor costs nearly as much as the ASUS VG248QE 144Hz monitor, but yet it offers the exact same specifications and in addition, the FreeSync technology. It is very affordable as well as offering great value for the money. So, if you have a compatible AMD graphics card and a limited budget for a monitor, the AOC G2460PF is the way to go. Besides offering the awesome 144Hz refresh rate, rapid 1ms response time, FreeSync, and low input lag performance, this gaming monitor also provides you with a plethora of connectivity options. There is a VGA, a Dual-Link DVI, an HDMI with MHL support for content streaming from your mobile device, a DisplayPort, four USB 3.0 ports, and the headphones jack available. Keep in mind, however, that only DisplayPort and the DVI port support the 144Hz refresh rate. The design may not have as slim bezels as most of the modern monitors, but its textured gray finish and the stylish red bottom bezel make up for it by its enticing appearance. Its ergonomics include VESA mount compatibility, height adjustment, tilt, and swivel abilities. 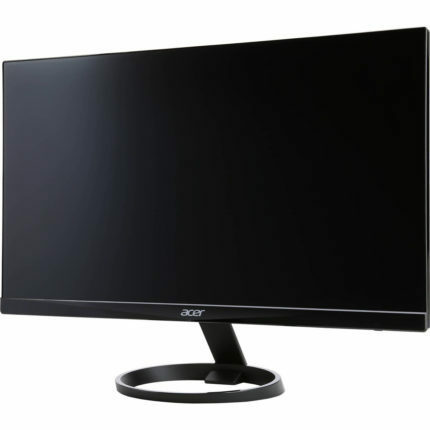 In addition, the AOC G2460PF TN monitor has some exclusive features including the 2x2W built-in speakers and two software applications on a CD. The first one, eSaver, allows you to set custom timers and actions when the monitor should turn off or enter the standby mode while the iMenu allows you to adjust all the OSD settings in a desktop application. It’s also important to note that its TN panel features 160-degree viewing angles which may not affect your gameplay while sitting in front of the PC, but if you’re watching a movie from a distance and at an angle, colors can shift in tone unless you adjust the proper angle by tilting the screen. 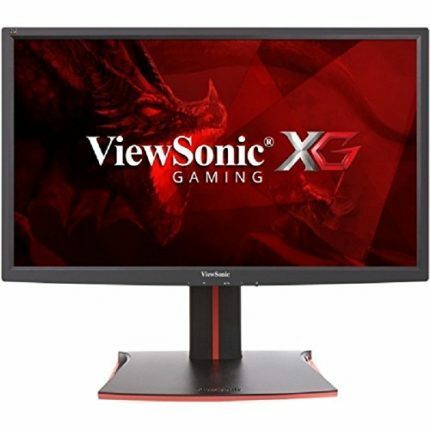 The ViewSonic XG2401 features a gamer-inspired design with versatile ergonomics and attractive red color accented appearance. The ergonomic functionalities include the ability for height adjustment from 0 to 120mm, pivot by 90 degrees, tilt by -5, 22 degrees, and swivel by 175 degrees as well as VESA mount compliance. It also features 2x2W built-in speakers, the headphones hook, and two USB3.0 ports at the side bezel for easy connection of your keyboard and mouse devices. Apart from the USB ports, connectivity options include an HDMI port and a DisplayPort. It’s not only design and convenience where the ViewSonic XG2401 PC monitor shines but performance as well. Smooth gameplay performance is ensured by the 144Hz refresh rate, 1ms response time, and FreeSync technology. Furthermore, the XG2401 offers some unique features that enhance the gaming experience, such as the Black Stabilizer feature for improved visibility in the dark scenes, a Low Input Lag mode, and well-optimized picture presets for FPS, RTS, and MOBA types of video games. The Samsung C24FG70 broke new ground with its innovative MPRT (Moving Picture Response Time) of 1ms that’s provided by its VA panel. The VA (Vertical Alignment) panel monitors are somewhere in between IPS and TN panel monitors as they too provide vibrant colors and the impeccable 178-degree viewing angles like the IPS, although a bit less accurate colors. However, they offer a superior contrast ratio which amounts to 3,000:1 in this case. Most VA panels have response time speed limited to 4ms, but the Samsung CFG70 PC monitor surpasses that and delivers the rapid 1ms response time for next-to-none ghosting of the fast moving objects. Furthermore, this amazing monitor has a slightly curved screen with 1800R curvature and the quantum dot technology for a wider color gamut that amounts to 125% of the sRGB. The sleek design offers plenty of ergonomic features such as the ability to tilt, swivel, pivot, adjust height, and VESA mount compatibility. Connectivity includes a VGA, a DisplayPort, and two HDMI ports. Not only does this revolutionary monitor offer an amazing image quality and flawless performance but a perfect gaming experience as well. It offers the FreeSync technology via both the DisplayPort (70-144Hz dynamic range) and the HDMI (62-119Hz dynamic range) as well as pre-calibrated picture presets for gaming scenarios including FPS, RTS, RPG, and AoS modes. Additionally, you can swap between the 60Hz, 100Hz, 120Hz, and 144Hz refresh rates. 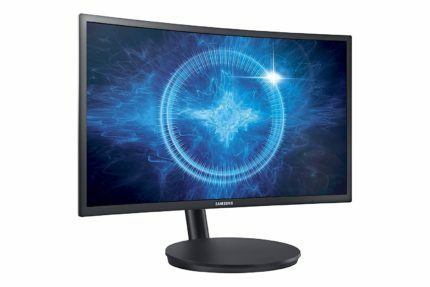 In short, there isn’t anything the Samsung C24FG70 FreeSync monitor is missing, yet it is available for a quite appealing price. For those who seek a remarkably detailed and spacious 24-inch gaming monitor the AOC AGON AG241QX will deliver. The WQHD resolution of 2560×1440 on a 23.8-inch monitor allows for the rich pixel density of 123 pixels per inch which results in a crisp image quality with expressive details and plenty of workspace to work with; in fact, you could fit four 720p HD videos on the desktop. Moreover, this gaming monitor offers 144Hz refresh rate and its TN panel allows for 1ms response time speed but at cost of 170-degree horizontal viewing angle and 160 degrees vertically. There’s plenty of connectivity options including a VGA, a Dual-Link DVI, an HDMI 1.4, an HDMI 2.0, and a DisplayPort. Only the DisplayPort and the DVI port support the 144Hz refresh rate and the FreeSync technology with 30-144Hz dynamic range. Additionally, there are four USB ports, 2x3W built-in speakers, and a device for quick navigation through the OSD menu called the Quick Switch Controller. The AOC AG241QX 1440p monitor offers full ergonomic versatility including VESA mount and pivot function. Just like our previous AOC model, this monitor also comes with e-Saver and iMenu software. If you have a FreeSync compatible AMD graphics card and are looking for the best 144Hz gaming monitor for the value, the Acer XF240H will offer you everything you could need for a reasonable and affordable price. 144Hz refresh rate, adaptive sync technology, and 1ms response time are the key specifications of a great gaming monitor for competitive gaming. Moreover, the Acer XF240H gaming monitor allows for long hours of uninterrupted gameplay without feeling eye fatigue thanks to its flicker-free screen and low blue light filter. In addition, its design besides looking gorgeous also offers extensive ergonomics including the ability to tilt, pivot, adjust height, rotate, and VESA mount. There are sufficient connectivity options such as DVI, HDMI, and a DisplayPort as well as 2x2W built-in speakers. Although only a 75Hz gaming monitor, the ViewSonic VX2457 monitor features quick response time, FreeSync, and numerous gaming features for an affordable price. It’s one of those rare good but cheap things. It features a TN panel with 2ms response time, crisp and vibrant image quality with a blue light filter and flicker-free screen. In addition, the black stabilization feature increases the visibility in the dark scenes of the video games while the FPS, RTS, and MOBA pre-calibrated gaming presets allow you to apply the optimized picture settings via the monitor’s hotkey. The display is VESA mount compatible and the screen can be tilted by -5, 23 degrees. There is a VGA, a DisplayPort, and an HDMI port available as well as 2x2W built-in speakers. All in all, it’s an amazing gaming monitor with a surprisingly good performance and image quality for its price tag. As we have listed all the best 144Hz gaming monitors available, we’ll go on to the 165Hz. The difference between the 144Hz and 165Hz won’t significantly improve the performance quality to an average player; in fact, some may not even notice it. However, the high-end professional players will as in their gaming sessions every millisecond and frame counts. So, there’s no need to upgrade from a 144Hz monitor to 165Hz solely for the refresh time increase unless you’re a professional competitive player. But if you’re upgrading from a 60-75Hz standard monitor, you could go straight for a 165Hz monitor since they’ve dropped in prices lately. 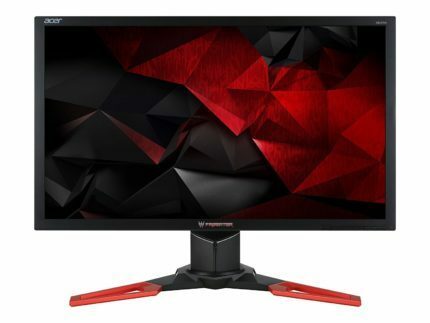 The Acer Predator XB241YU G-SYNC monitor is essentially the 1440p resolution version of the Acer Predator XB241H monitor that we’ve already mentioned at the top. Another difference is the refresh rate since the Acer XB241YU display can be overclocked to 165Hz whereas the Acer XB241H maxes out at 180Hz. The higher resolution allows for a more detailed image quality as well as more vibrant colors thanks to its superior TN panel that covers 100% of the sRGB color gamut and offers the 6-axis color configuration in the OSD. All of the other features and specifications are identical, so it’s a choice between a better image quality or a slightly better performance. Moving on, the 165Hz AOC AGON AG241QG gaming display is also an alternate version of a monitor we’ve already mentioned, the AOC AG241QX. Besides the difference in the resolution, the AOC AGON AG241QG display offers G-Sync instead of FreeSync, it’s overclockable to 165Hz, and features an 8-bit color TN panel. Although Dell is more popular for their photo editing and professional monitors, the Dell S2417DG is a gaming beast dressed in a beautifully designed cabinet and ultra-thin bezels ideal for multi-display. The narrow bezel makes for a cinematic viewing experience as the picture simply pops out. The flawless experience is ensured by G-Sync, 1ms response time, and 165Hz refresh rate. The design offers full ergonomic functionalities including VESA mount compatibility and the option to pivot. The screen is covered with an anti-glare 3H coating which entirely eliminates the sunlight reflection. In the OSD menu, you can also customize and swap between well-optimized gaming presets for FPS, RTS, and RPG genre of games. We’ve already mentioned the requirements for playing at 240Hz as well as its pros and cons. However, if you’re a high-end competitive player, you won’t skip a chance to gain the edge over your opponents with the state-of-the-art 240Hz gaming monitors. These 24.5-inch monitors were released earlier this year and feature all the same specifications as their predecessors from the corresponding series except that they feature a native 240Hz refresh rate. If you have a Nvidia graphics card, you have a choice between the ASUS ROG Swift PG258Q gaming monitor and the Acer Predator XB252Q while the AMD users should opt for the AOC Agon AG251FZ gaming monitor or the BenQ Zowie XL2540 display. In short, the ASUS PG258Q and Acer XB252Q gaming monitors feature the same features and specifications as the ROG Swift and Predator series monitor we’ve mentioned already such as the FPS counter, crosshair overlay gaming features, and a 6-bit+FRC color panel. The AOC AG251FZ FreeSync monitor features a TN panel with 1ms response time, flicker-less screen, and a low blue light filter. For enhanced gameplay experience, there is the AOC Shadow Control feature which increases the visibility in the dark scenes and FreeSync adaptive sync technology. The BenQ XL2540 includes all the features of the BenQ XL series with an addition of the shield device which you can see in the picture above. This item can be used to remove distractions and keep you immersed in your video game. Other features include the S. Switch device for convenient OSD settings management, black equalizer feature, and FreeSync. At first, these ultimate gaming machines weren’t well-received due to the high price increase over the 180Hz monitors for only a slight visible improvement; the price of most of these has dropped since then which should make them more viable. The Dell UltraSharp U2415H professional monitor can be used for many purposes due to its extensive connectivity, ultra-slim design, and highly accurate IPS panel. First of all, it features the 1920×1200 resolution for extra vertical space for your work, and it’s factory calibrated to delta < 3 and covers 99% of the sRGB color gamut. It has all ergonomic abilities including the ability to pivot which makes it ideal for various different multi-display setups as its bezel is only 6.9mm thick. When it comes to the connectivity options, there are two HDMI ports with MHL support, a DisplayPort, mini-DisplayPort, and the DisplayPort-out for daisy-chaining, an audio line-out, and five USB 3.0 ports at the back, one of which supports fast battery charging. The IPS panel limits the response time to 6ms in the fast mode, which makes it unusable for the professional FPS gamers, however, casual gamers will rather enjoy the vibrant image quality and sharp resolution. The screen of the monitor is coated with an anti-glare protection. Overall, the Dell U2415H IPS display is a reasonably priced monitor with premium features, extensive ergonomics and connectivity, flawless design, and stunning image quality. 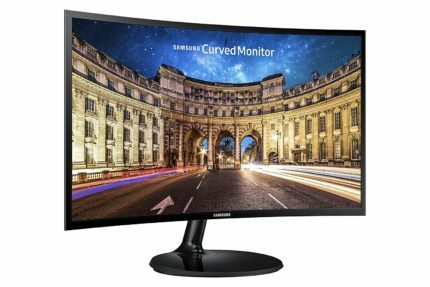 Samsung gives us yet another 24-inch monitor with an innovative technology, this time with the Qi wireless charging base. Simply put your compatible mobile phone on the base of the Samsung S24E370DL and let it charge while it’s within your sight as you work or play video games. The elegant yet modern design consists of an icy blue finish around the ultra-thin bezel and a glossy white cabinet while the screen is covered with a matte finish. However, it has limited ergonomics as only the screen is adjustable by around 20 degrees of tilt. The image quality is superb with vibrant and consistent colors thanks to the PLS panel. The PLS panels are a more budget-friendly version of the IPS, but they also provide you with the impeccable viewing angles, quick response time, 4ms in this case, and brilliant colors. The Samsung SE370DL PLS monitor also provides you with a smooth and immersive gaming experience with the FreeSync technology, but it’s limited to 60Hz. All in all, this beauteous monitor offers some cutting-edge technology and a celestial design for an appealing price even if you don’t need the wireless charging. Unfortunately, cheaper but better cannot be said about many things, but the Dell P2415Q is an exception as it surpasses the image quality, design characteristics, and performance of all the 4K monitors in its price range. It’s basically the same perfect model as the Dell U2415H PC monitor including the factory calibration, extensive connectivity, and the ultra-thin design. However, this monitor boasts the 3840×2160 resolution. That’s over 8 million pixels more than 1080p, enough to fit four Full HD movies on your screen. 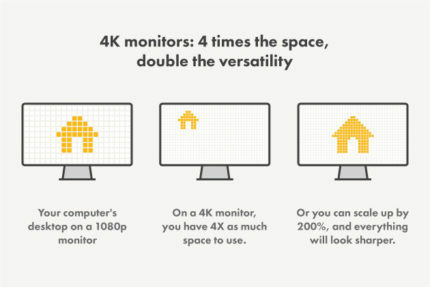 Like 144Hz monitors, the 4K resolution has its requirements when in comes to the smooth gameplay experience, so make sure you have the proper computer equipment. It was not until March 2017 that Dell significantly dropped the price of their 24-inch and 27-inch 4K monitors that made them available to everyone at an appealing price. 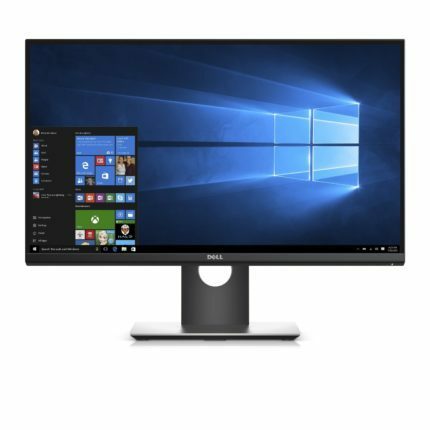 Another great and affordable 4K monitor that can parry the Dell P2415Q is the 23.6-inch ASUS MG24UQ 4K display. Choose this monitor if you’re looking for a more gaming-oriented 4K monitor. It features an IPS panel with highly accurate and consistent colors that cover 100% of the sRGB color space and 4ms response time for next-to-none ghosting of the fast moving objects in video games. Moreover, FreeSync significantly improves the gameplay performance at 4K. There is an HDMI 1.4, an HDMI 2.0, and a DisplayPort at the back of the monitor. It offers full ergonomic abilities including pivot and VESA mount compatibility. Like most of the ASUS gaming monitors, the ASUS MG24UG 4K UHD monitor provides you with the GamePlus and the GameVisual features which allow you to place a custom crosshair on your screen as well as a timer and an FPS counter. The navigation through the user-friendly OSD menu is as simple as it gets thanks to the 5-way joystick. This gorgeous, 1800R curved monitor is affordable for an enticing price yet it offers a fascinating image quality, an attractive design, and a smooth performance. The Samsung C24F390 features a VA panel which delivers 178-degree viewing angles, the superior 3,000:1 contrast ratio, and a rapid 4ms response time. Moreover, FreeSync makes this monitor ideal for AMD users who are seeking a curved and cheap monitor for gaming, although it maxes out at 60Hz which is expected for the price. Naturally, the screen is flicker-free and has a blue light filter which will along the comfortably curved screen allow you to enjoy working, watching movies, and playing video games for hours without straining your eyes. The design is ultra-thin measuring only half an inch in width while the glossy black cabinet and the metallic silver finish make for a modern and alluring look. Note that there is only one VGA and one HDMI port available. Although there are gaming TVs nowadays with reduced lag and response time, none of them can come close to a gaming monitor, especially if it’s designed for the gaming consoles. 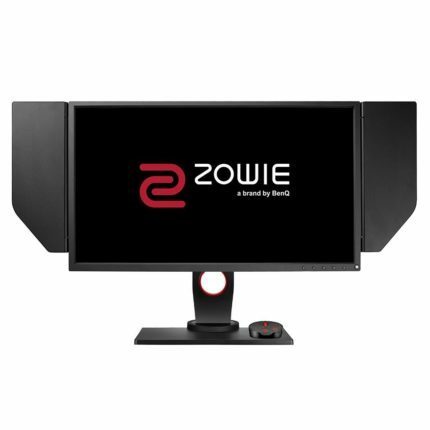 The BenQ Zowie RL2460HT console gaming monitor is the official eSport monitor for various tournaments for Call of Duty, Halo, Fifa, and many other competitive console games. It features a TN panel with 1ms response time for zero ghosting, trailing, or motion blurring of the fast moving objects in video games. Like in most of the BenQ gaming monitors, the black equalizer makes sure that you have increased visibility in the dark scenes of the games. There’s plenty of connectivity options available including three HDMI ports, a VGA, a Dual-Link DVI, the headphones jack, and an audio line-in port. The monitor also offers plenty of ergonomic features including a VESA mount compatibility and height adjustable stand riser with a scale. If you are still having second thoughts on whether a monitor is really necessary for a gaming console, you can check our gaming TV vs monitor article for a more thorough comparison. Keep in mind that the BenQ Zowie RL2460HT TN monitor allows for the unique head-to-head combat setup which allows you to split an HDMI connector and stream or record your gameplay with zero lag. In addition, the Game Mode Loader software allows you to download picture settings from professional players and apply them to your monitor. This concludes the list of the best 24-inch monitors available. For more thorough reviews you can search each monitor individually on our website and have a look at its ratings, comments, and full specifications. Let us know in the comments if you think we’ve missed any great 24-inch monitors while we keep the list up to date. For all of you out there who find 24-inch monitors to be a perfect size, now you can find your perfect monitor with certainty and next-to-none effort, whether it’s for casual or competitive gaming, photo editing and designing, or on a budget for everyday activities.